The Supreme Person is supreme in every way—omniscient, omnipresent, and omnipotent. He's also the most attractive person, meaning He has a form. Without knowing this supreme, spiritual form, people often have an impersonal conception of God. Krishna's Deity form can be easily misunderstood. 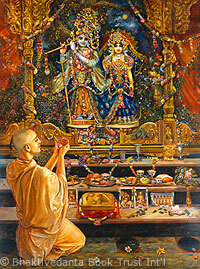 Devotees of Krishna worship the personal Deity form of the Absolute Truth, in temples and in their homes. The Deity is understood to be Krishna Himself. Since God is absolute, there is no difference between Krishna and His name or His form. For this reason, worshiping the physical representation of Krishna's form, the Deity, can help anyone make spiritual advancement. There's a vast difference between Deity worship and idol worship. The Concept of Deity Worship—A brief introduction to the thinking behind the Vedic tradition of honoring various images of God as divine. How do we understand the temple Deity?—An Indian living abroad reflects on the vital importance of establishing a relationship with Krishna in His Deity form. The Vision to See Life in Stone—"When we make the form of Krishna in stone, then we worship stone—not that we worship just any stone." Whose Worship is Idol Worship?—God is certainly everywhere, but we cannot see Him everywhere. Therefore the Lord appears as the Deity in the temple so that we can see Him. Encounter With the Lord of the Universe—How Krishna—in His Deity form as Jagannath—came to the Western world, and how He came to stand on a shelf above one unsuspecting Westerner's desk. We Worship Everything—"Krishna" means the ultimate source of all energies. "Hare" means Krishna's energies. So, when you say "Hare Krishna," you've said everything. One of the most scientific explanations we've ever heard of the difference between God and other living beings. Exchanges of feelings between the Deity and the devotee are not understandable by atheists. How Do We Understand The Temple Deity? An Indian living abroad reflects on the vital importance of establishing a relationship with Krishna in His Deity form. We can't see God everywhere, even though He's omnipresent. He appears as the temple Deity just so we can see Him. How Krishna—in His Deity form as Jagannath—came to the Western world, and how He came to stand on a shelf above one unsuspecting Westerner's desk. "When we make the form of Krishna in stone, then we worship stone—not that we worship just any stone."